Gardens are typically beautiful, as long as they’re planned well and someone cares for them over time, right? What are some reasons to have your garden built by a professional landscaper, like someone from Vista Pro Landscape & Design? A professional landscaper thinks of things the ordinary person probably doesn’t… like what direction to orient the garden so that it gets the kind of sun or shade that’s best for what’s planted in it. Also, does it need fencing to protect against certain animals in the area? How’s the soil that’s already there? Is it fertile or dead? Does new soil need to be brought in? Or fertilizer? A professional understands both the macrocosm and microcosm details of an area, and how a garden relates to the larger ecosystem around it. With regards to a garden “making sense” in a certain space, a professional landscape designer not only analyzes the site, but also comes up with a couple conceptual designs for the homeowner to pick from. Once the design is narrowed down to what the homeowner truly wants, then the designer gets to work with construction planning. He or she will come up with a plan to actually build the garden in a sustainable way– after all, people want their gardens to last a long time so they need to be ultimately sustainable. Furthermore, a professional landscaper can help the property owner with figuring out their budget. While most homeowners have pretty grand ideas for what they’d like, oftentimes they’re not able to afford all the “bells and whistles” they listed on a piece of paper. Okay– then the landscaper gives an account of what costs what, such that the homeowner decides what to “keep” in the plan, and what to get rid of because it’s too costly or not really needed. For really elaborate gardens to be built, they can require a lot of time and money– they might need to be built in phases over the course of a couple years as the budget allows. 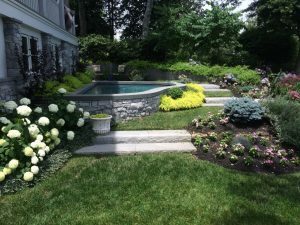 Working with a professional landscaper on garden plans is a good idea because he or she becomes your contractor liaison and/or project manager, taking the stress off you. Should something unexpected “pop up” during construction, they’re going to handle the issue– not you. Now’s a good time to talk over your garden ideas with someone from Vista Pro; please call 301-805-0119 to get started, or use the online contact page.